The Virginia Home is home. Whether it’s spiritual care, counseling, housekeeping, guest accommodations, or help with wheelchair maintenance, The Home provides care that brings the warmth of home to each resident. The ability to independently move around the community is a high priority. Wheelchairs are common here, and most use power wheelchairs. Most residents need customized chairs to provide comfort, support, and skin protection for full day sitting. Therapists are responsible for evaluating and exploring funding sources for wheelchairs, and finding the right devices for each resident. Specialized cushions are needed to protect a resident’s skin, and we have a pressure-mapping system to evaluate sitting pressures to help determine the most appropriate cushion. The specifications for the whole system are completed with the assistance of local vendors. We have a highly skilled wheelchair technician on staff. He is able to accept wheelchair donations and make modifications to them so our residents can use them, in addition to performing routine cleaning and maintenance of all resident wheelchairs. We maintain the latest technologies, serving residents’ needs to remain as independent as possible. 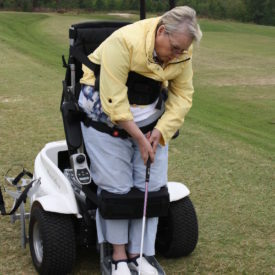 Power wheelchair drive control methods, custom molded positioning systems, phone access, computer access, mobile tablet access and environmental control units are just some of the things our teams evaluate, provide, train and maintain. A beautifully decorated and comfortable Guest House is located next door to The Home. Family members may stay at no charge.